The DreamLine Duet sliding bypass shower or tub door has a sleek, elegant design that will complement both classic and modern bathroom decors. The Duet features semi-frameless glass and smooth gliding rollers for a touch of traditional style, and offers a clean, streamlined appearance. DreamLine exclusive ClearMax water repellant and stain resistant glass coating adds superior protection from stains and is nearly maintenance-free. Bypass configuration allows entry from either side. Q-Wall Backwall kit has an attractive tile pattern for a modern look and 2 convenient glass shelves. Trim-to-size sidewall panels can be cut during installation. Q-WALL Tub Backwalls are installed against a solid surface, such as wonderboard or greenboard (not directly to studs). Limited Lifetime Manufacturer Warranty for Tub Door; Limited 1 (one) year warranty for Q-WALL Backwalls. Tub is not included with this kit. The DreamLine Flex pivot shower door, SlimLine base, and Q-Wall backwall kit offers modern appeal at a budget friendly price point. The versatile Flex model combines cutting-edge pivot hardware, simple installation and dependable performance. Complete your bathroom with the elegant and innovative look of the Flex shower door, SlimLine base, and Q-Wall backwall kit from DreamLine for the complete solution for your shower project. Infinity-Z 30-inch x 60-inch x 76.75-inch Framed Sliding Shower Door in Brushed Nickel with Left Drain Base and Back Wall The DreamLine Infinity-Z sliding shower or tub door offers classic style with a modern touch. The Infinity-Z will transform your bathroom with a beautiful balance of functionality, elegance and sophistication. A variety of finishes and glass options will match any bathroom decor. The included SlimLine shower base completes the look with a low profile design for a sleek modern look. 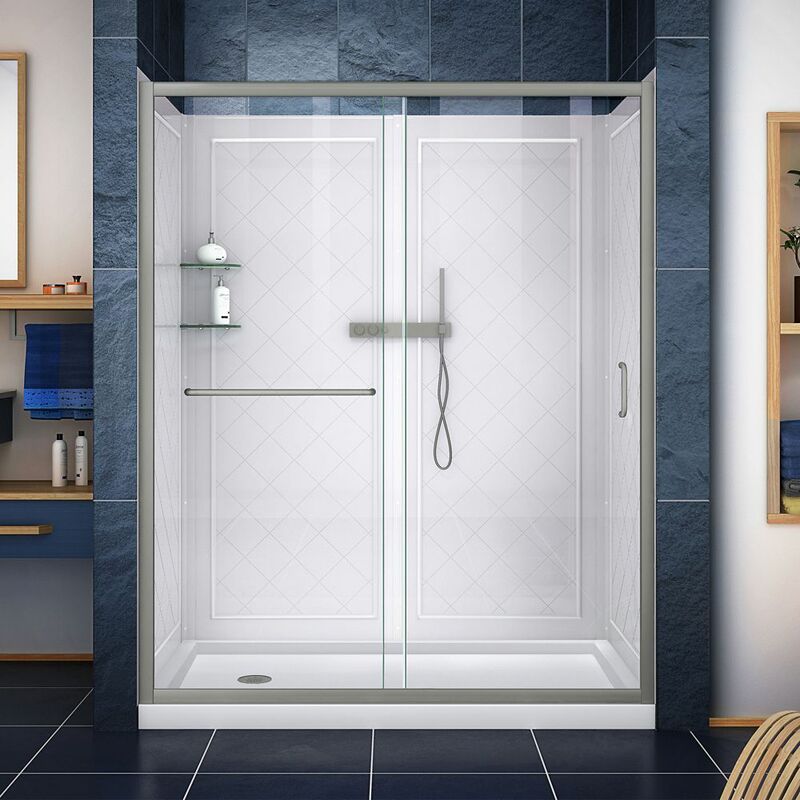 The base has a glossy acrylic finish that is scratch, slip, and stain resistant for safe showering and is reinforced with fiberglass for durability. Plumbing codes vary by state, DreamLine is not responsible for code compliance. Drain opening fits any standard 2 in. compression fitted drain (Drain not included). The Qwall Backwall features an attractive tile pattern for a modern, trendy look and 2 glass shelves for storage. Shower Door and SlimLine Base: Limited Lifetime Warranty (Oil Rubbed Bronze finish limited to 1 year warranty); Backwalls: Limited 1 Year Warranty. Professional installation recommended. Infinity-Z 30-inch x 60-inch x 76.75-inch Framed Sliding Shower Door in Brushed Nickel with Left Drain Base and Back Wall is rated 4.8 out of 5 by 4. Rated 4 out of 5 by Rich from Love the walk in Shower. Love the walk in Shower. Rated 5 out of 5 by JD from We are very pleased with the quality & ease of assembly of this shower kit. We are very pleased with the quality & ease of assembly of this shower kit. Rated 5 out of 5 by Thomas from The packaging was amazing for the main components and all... The packaging was amazing for the main components and all small parts. I was quite impressed. Installing the product took me some time but was well worth it.